Several years ago we were approached by Europe's largest manufacturer of fine OEM (factory) wooden stocks - laminates, walnut and even maple - to be their exclusive aftermarket distributor in the U.S.A.. These folks make everything from simple military stocks to the finest exhibition-grade walnut stocks in the world. Beretta®, Krieghoff®, Blazer®, Weatherby® - the finest sporting arms anywhere are stocked with their stocks. They explained to us that although they have been supplying these stocks to European and American manufacturers since 1937, they have never done anything in the aftermarket. 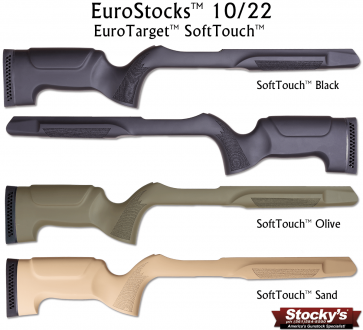 We knew you guys and gals would want some of the finest 10/22® stocks in the world so Stocky's® EuroStock™ for the 10/22® was born soon thereafter. Cheek height ideal for scoped rifles. New heavy-duty cap head takedown screw with washer - these are the same screws we provide with our M5 R700® DM bottom metal for 1000 yard centerfires, in a proper size for the 10/22®, to replace that ridiculously spindly undersized screw that most people use. The selection, fit and finish are exactly what you'd expect from a premium OEM supplier, simply outstanding. In fact I would venture to say these are the finest production stocks in the world, certainly better than we've seen in a very long time - I'm thinking back to the S & K Gunstock days. They're that nice.